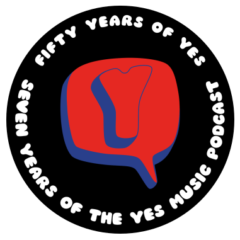 The twenty-eighth episode of the Yes Music Podcast featuring the unique tracks from the compilation album, ‘In a Word: Yes’. Should these tracks have been left on the cutting room floor? Is it worth trying to find them? Are they only of historical value? It’s interesting to note that ABWH tracks are included here, despite not being ‘officially’ Yes music. This is, perhaps, partly due to the fact that Steve Howe is credited with ‘Additional Archival Research & Mixing’ in the sleeve notes. Certainly, Howe appears on each one of the previously unreleased tracks. The remarkable and generous Paul Wilson has sent the following links in which will fill in some gaps to say the least! “Richard” was actually from the Tormato sessions, not Paris. Thanks John. I was getting very confused as to what was recorded when. I think I also relied on a wikipedia page which seems to have been less than accurate! “Crossfire” was from the instrumental sessions with Howe, Squire and White after Anderson and Wakeman left. These sessions are widely avaialble on various bootlegs, most of which can be downloaded. “Song Nº 4 (Satellite)” and “Do We Really Have To Go Through This” is also from the sessions and was released on the expanded “Drama” CD. “Satellite” is a completely different song and bears no similarity to Song Nº 4. Anyone’s guess is as good as mine, why they put in the title. Satellilte is, basically, an early version of “I’m Running”. Also available on bootlegs. Give it a listen! I have the expanded Drama CD so I will now listen to those tracks with renewed interest. The genesis of the tracks and different line-ups are fascinating! It’s great to have you listening and keeping me correct on the details – please keep it up!